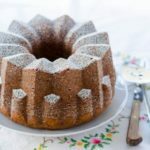 A recipe for a pound cake made with Madeira wine and baked in a bundt pan. It also has pecans for extra flavor and texture. Preheat the oven to 350 degrees F. Grease and flour a 10- or 12-cup bundt pan and set aside. In a large bowl, cream together butter and sugar until light and fluffy. Add egg yolks, one at a time, beating well after each addition. In a medium bowl, whisk together flour, baking powder, salt, and nutmeg. Add flour alternately with the Madeira to the creamed mixture, beginning and ending with the flour. Mix well after each addition. Stir in chopped nuts. In a large bowl, beat egg whites until they have reached stiff peaks. Fold egg whites into the batter. Pour the batter into the prepared bundt pan. Bake for 50 to 60 minutes or until a toothpick or cake tester inserted into the center comes out clean. Cool cake in the pan for 15 minutes. Turn out cake on a wire rack and cool completely. Dust with powdered sugar before serving.